The .30-06 rounds in this case of 500 from the Barnaul Machine Plant in Russia use brass-plated steel casings. Though still not reloadable, the brass-plated casings help keep your gun clean and prevents the oxidation or lacquer fouling associated with other platings. These cartridges use non-corrosive Berdan primers for easy maintenance compared to surplus ammo and fire a 145 grain bimetal jacket bullet. The bullet's magnetic properties may make it unsuitable for some indoor ranges, but with a .30-06 in your hands, you'll want to head outdoors anyway. 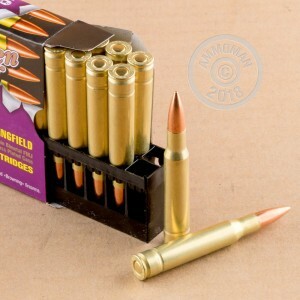 Used in several generations of firearms including the M1903 Springfield and the M1 Garand as well as countless other rifles designed for snipers and hunters, the .30-06 Springfield is one of several long-range rifle cartridges that remains popular decades after its replacement in military use. It has an excellent reputation for long-range power and accuracy. Purchase more than $99 in items from AmmoMan.com to qualify for free shipping. This offer applies to virtually all of our centerfire pistol and rifle ammo cases of 500 and 1000 rounds. Really accurate and the price is great. Total up anywhere else and it costs more than ammoman. clean shooting. 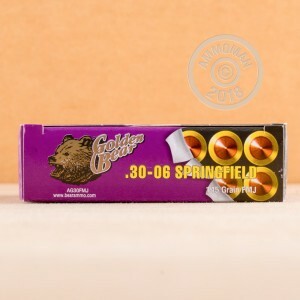 I opted for the brass coated 30-06, have used most other calibers of Wolf ammo in the past. I had no problem in a M1Garand. Accuracy was very good. It appeared to be cleaner than a lot of other brands. I would buy this again. no problem feeding, burns pretty clean, accuracy is darn good out to 300 yards cycles M1 with no problem.